Impressive Audio and Features a Stunning Smart App-Controlled Light Show that Dances to the Music. 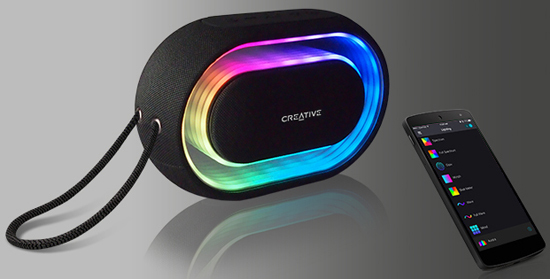 Creative Halo delivers impressive audio performance and comes with a hidden surprise: its front panel pulsates with an optional multi-coloured light show. Users can choose from 12 mesmerizing halo effect patterns that can be activated by pushing a button or through an app on a smart device. Under the hood, the Creative Halo features two in-house tuned full-range drivers mounted into a large reflex chamber, and together with a passive woofer delivers surprisingly big sound with enhanced bass. Featuring a futuristic minimalist ID that looks like it came out of a sci-fi movie, the Creative Halo – clad in bold charcoal gray matt weave nylon and embellished with a mirror-finish reflective front panel – will appeal to enlightened users with an eye for design. * Based on moderate volume level, moderate to low LED light show pattern/brightness. Actual battery life will vary with use and settings and environmental conditions. The Creative Halo is available from September 2017 and will be priced at £59.99.